Formerly known as a dual diagnosis or dual disorder, a co-occurring disorder refers to the presence of a mental illness, personality disorder, or addiction alongside a substance abuse disorder. The term may also refer to separate, but co-existing disorders, such as anorexia nervosa and depression. The possible combination of co-occurring disorders is vast, and the relationship of the disorders to the severity of impairment is just as varied. The key to the diagnosis is having two distinguishable disorders that are independent of one another. Co-occurring disorders are the result of both genetics and environment, and conditions may build upon one another: individuals who suffer from a mental health disorder are more likely to develop a substance abuse disorder, and conversely, substance abuse disorders can cause psychological distress, which in turn may cause symptoms of mental illness and anxiety disorders. Co-occurring disorders are common among individuals who struggle with substance abuse. According to government data, about half of people with mental illness will also suffer from drug or alcohol addiction at some point in their lives. Moreover, a 2016 study showed that 8.2 million adults (about 3.4% of the total U.S. population) had a diagnosed mental illness or personality disorder alongside a substance abuse disorder in the last year. Although any individual who suffers from mental illness is more likely to develop a substance abuse disorder than the general population, environmental factors can either promote or diffuse the development of a co-occurring substance abuse disorder.For example, children predisposed to mental illness whose parents who abuse drugs and alcohol are more likely to develop a co-occurring substance abuse disorder themselves as adults than children who grew up in drug-free homes. Similarly, children who receive early treatment for anxiety, depression and other common disorders are less likely to develop problems with drugs or alcohol than those who remain undiagnosed through adulthood. 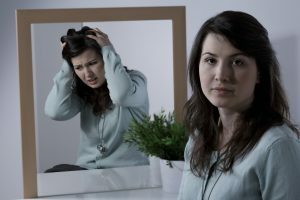 The symptoms of co-occurring disorders will vary by the psychological disorder and substance abuse condition with which the person has been diagnosed. However, friends and family concerned about a loved one can watch for a few common signs. For example, a loved one may fail to fulfill responsibilities in school or at work. He or she may become reclusive, spending more time alone or with “new” friends. Individuals may also show signs of financial distress, sudden trouble with the law, or an increased frequency of hospitalization. Seeking treatment immediately if you recognize these signs is important, as these individuals are also at a higher risk for homelessness, suicide and early death. Individuals with co-occurring disorders require a personally tailored approach to treatment, starting with a comprehensive evaluation that considers medical history, previously diagnosed disorders, family support and history of past treatment. At Sprout Health Group, we approach every client individually, creating a personalized plan with dedicated treatment for both substance abuse and mental illness. It is common for individuals with co-occurring disorders to require lengthier substance abuse treatment and have more gradual progress than those with a singular diagnosis. However, clients often have higher hopes for recovery after learning of a dual diagnosis because they finally have answers for some of the challenges that may have prevented recovery in the past. Clients can now look forward to developing healthy coping mechanisms for managing stress, anxiety, and other symptoms of common co-occurring disorders. After determining the physical and emotional state of the client, behavioral therapy is often the next step. Cognitive Behavioral Therapy (CBT) is a core treatment modality at Sprout for its effectiveness at helping clients develop practical coping mechanisms and healthy thought patterns. Group therapy with others who have co-occurring diagnoses and family therapy are also important aspects of treatment. Some clients will need medication for the addiction and/or the psychiatric condition. The right combination of treatments will vary by client, as the key to successful treatment personalization. At Sprout, we work only with experienced clinical and medical professionals who specialize in their expertise regarding substance abuse or mental health. Our clinicians work with clients to help them understand their diagnosis, how a co-occurring disorder may affect their recovery, and what they can expect through every step of the process. A final, essential aspect of recovery is aftercare. Here, we guide clients through the transition from treatment to life in sobriety with the services they need to feel empowered as they begin a new life. If you or someone you love suffers from substance abuse issues, help is a phone call away. Call us to learn about our assessment approach and how it can help you discover a co-occurring disorder.